In this class the girls learned to make ladders of bugle beads and to add seed bead fringe. A center “treasure” to put on a loop of beads. These included charms, fancy beads, and small pendants. Fringe “Treasures:” small charms, small fancy beads, teardrop beads, stone chips, and other small goodies to put at the end of strands of fringe. A small piece of leather or ultrasuede to cover the pin finding. To make this project manageable, I had ordered the smallest pinbacks I could find, so the bead ladder and the fringe hanging from it did not have to be too long. I packed small bags of bugle beads and some coordinating seed beads. I had separate containers for the bigger items to use in the center position (one per girl) and for the smaller pretties to go the the ends of the fringe. Once the girls had looked at the samples, they chose a little pre-packed bag of bugle beads and coordinating seed beads. 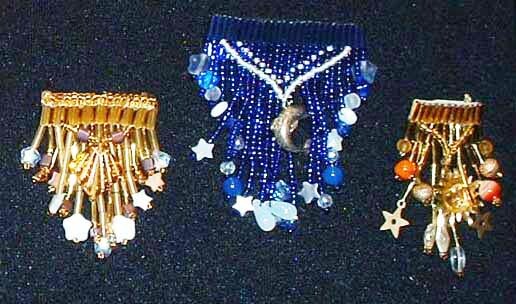 They had fun choosing a special center "treasure" charm or small pendant to put on a loop on beads in front of their fringe and some smaller "treasures" to use at the end of some or all of their lines of fringe. Some of the girls were able to thread their own needles, but a lot of them needed help. Once we got past the needle problems, most caught on pretty easily to making the ladder of beads. Then I showed them how to go through the ladder to attach each strand of fringe, and that went okay. They finished the beading by adding a single dangling loop of beads with their center treasure on it. This loop was attached to the outside bugle beads at each end of the ladder, or to the bugle beads next to the outside beads. The girls were very excited at the idea of this project but it was pretty frustrating to them. Some of the (donated) bugles had sharp edges and we had to start over as their thread kept falling apart. Almost everyone had trouble with thread tangling. Most of this would have been better with a very small class, as opposed to my class of sixteen 8- to 12-year-olds. I ended up taking their pins home to glue on the pin back myself, because there just wasn't time for it in class. If I taught this again, I would use the DynaMite bugles by Matsuno that Fire Mountain Gems sells. The ones I have used from that line all had nicely round edges. This was not the place to use donated beads, however pretty they may have been! We ended the class by looking at samples of the power bracelets that we would make in the next class.